WMAP Five-year Paper Figures, Hill, et al. 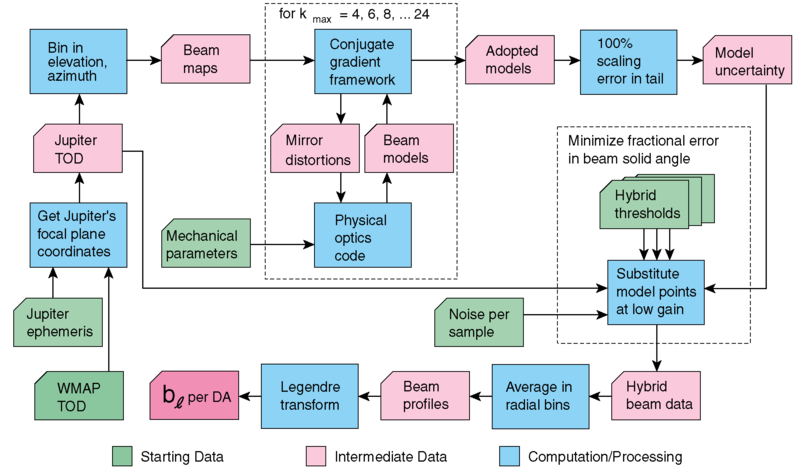 Flow chart of beam and window function processing. Boxes are color coded as follows: green, starting data; pink, intermediate data; blue, computations or processing steps; magenta, the result, bl, which is the beam transfer function. The window function, wl, for power spectra Cl involving a single DA, is b2l . Dashed boxes enclose iterative algorithms. 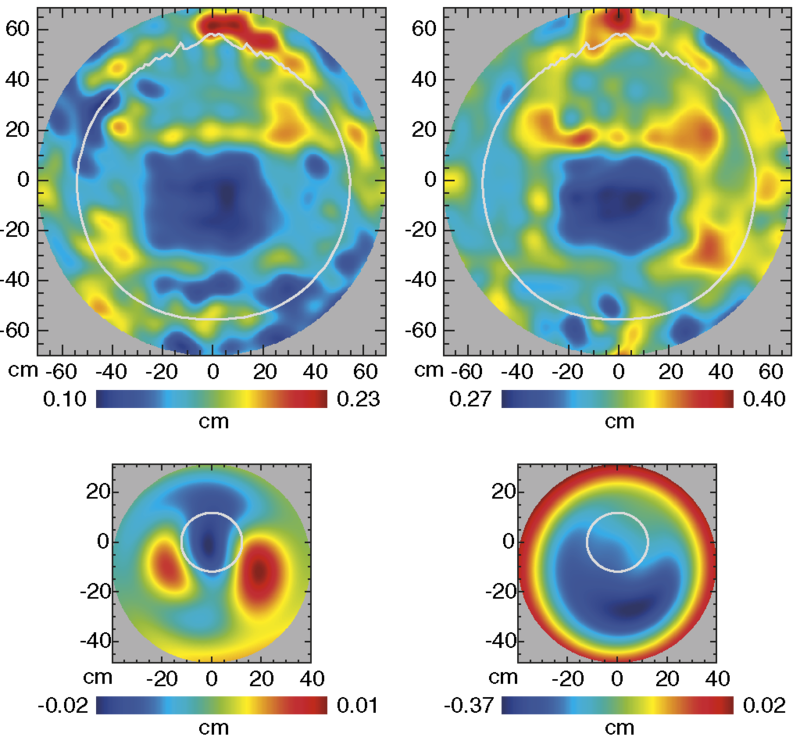 Beams in the WMAP focal plane for side A (left) and side B (right). The top panels show the measured beams, the middle panels show the beam models, and the bottom panels show the residuals. In the top four panels, each beam is scaled to its maximum (red) and plotted logarithmically to a level of -40 dB (blue). 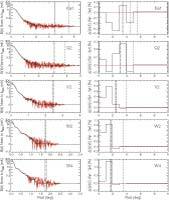 For the bottom panels, each beam’s residual is shown linearly as 100(data-model)/beam peak. The scales are ±10% for K1; ±5% for Ka1, Q1, and Q2; ±3% for V1 and V2; and ±2.5% for W1–W4. A similar depiction of the A side only for three years of data is in Figure 9 of Jarosik et al. (2007). Fitted distortions of the A-side (left) and B-side (right) mirrors with respect to nominal shapes. Y axis is negative in the sky direction and positive toward the main spacecraft structure. Top row: primary mirrors. The dominant feature of the primary mirror distortions is the central rectangle, corresponding to a frame that is part of the backing structure. Hints of the stiffening lugs in the backing structure may also be seen around the edges. Bottom row: secondary mirrors. The mirrors are constrained only where they are substantially illuminated by the feed horns (Page et al. 2003b). Thus, for example, the secondary mirror for the B side appears as a bull’s-eye partly because the fit is only constrained near the center. Gray line: contour of the mean W band illumination function -15 dB from the peak. Growth of solid angle in model beams as a function of kmax, for the V2 DA on the A side. Top: logarithmically scaled images of the model beam pattern as fitted for kmax = 12, 14, 16, 18, 20, 22, and 24, respectively, together with a beam that combines the kmax = 24 fit with random-phase modes extrapolated to k = 250. Axis tick marks are at 1° intervals. 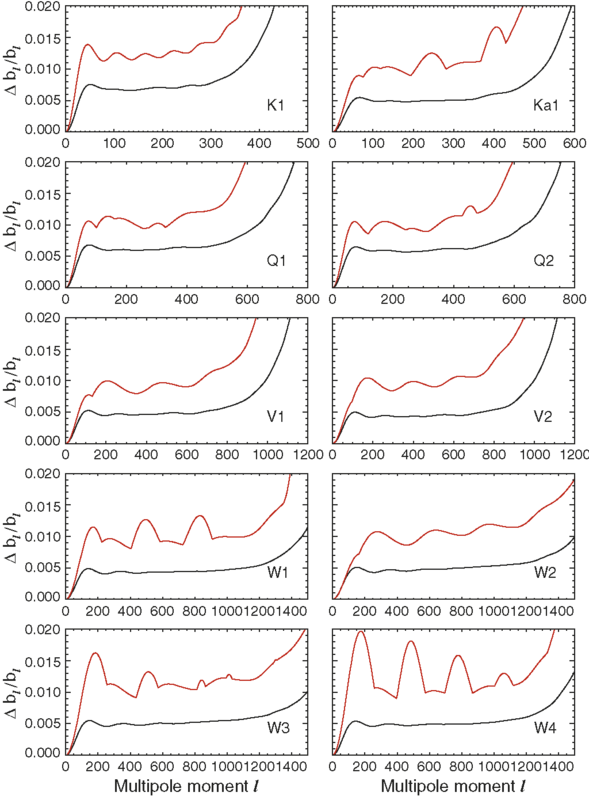 Bottom left: azimuthally averaged beam profiles for the models pictured, in units of gain relative to isotropic. 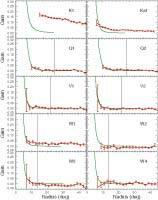 Indigo–red: profiles of the seven beam models from kmax = 12 through kmax = 24, respectively. Gray: kmax = 250 extrapolation result. 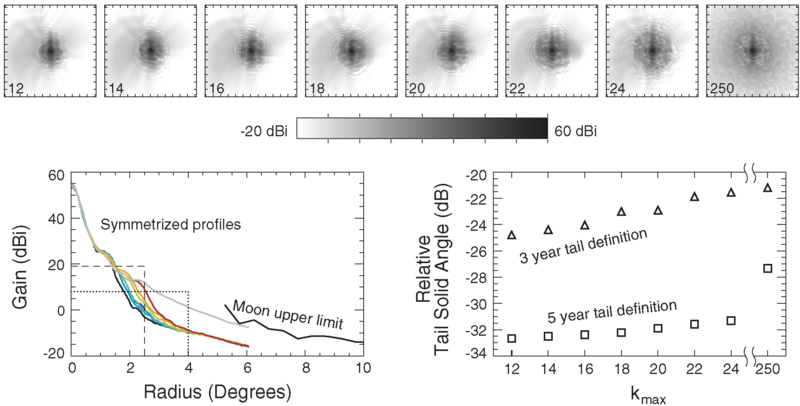 Black: Upper limit on the main beam sensitivity from Moon observations, obtained for side A by integrating over positive pixels in the differential sidelobe response pattern. The five-year model tail, which is a feature of the two-dimensional beam pattern, is the part of the beam that is both inside the transition radius and below the hybridization threshold (dotted line; see ξ3.3). The hybridization threshold and transition radius from the three-year analysis are indicated by the dashed line. Bottom right: model tail solid angle as a function of kmax, relative to the total solid angle inside the transition radius; squares, five-year; triangles, modified tail of five-year models, using three-year threshold and transition radius. Fitting to kmax = 24 rather than kmax = 12 increases by a factor of ~ 2 the solid angle of the model tail as defined by three-year main beam limits. But note that the difference between the various fits is ~ 0.1% of the total beam solid angle for the 5 year data. Power spectra of A-side (top) and B-side (bottom) primary mirror distortions as a function of spatial frequency on the primary mirror surface, f = k/(280 cm), where k is the spatial frequency index used in the physical optics fits. Vertical bars on the f axis indicate f corresponding to k = 12 and k = 24. 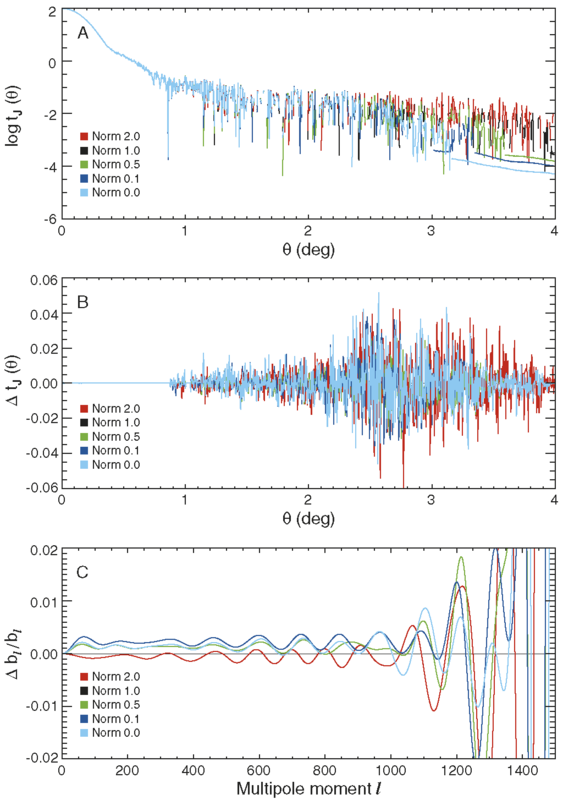 Solid lines: extrapolated power-law distortion spectra with slopes fitted by comparison to Moon sidelobe data, namely, α = 4.95 for the A side and α = 4.43 for the B side. In practice, these extrapolated distortions are used to update the sidelobe response patterns, but not to model the main beams. The error bars and upper limits show the mean absolute deviation about the mean of points with length scales less than 15 cm, indicated by the dotted vertical line. 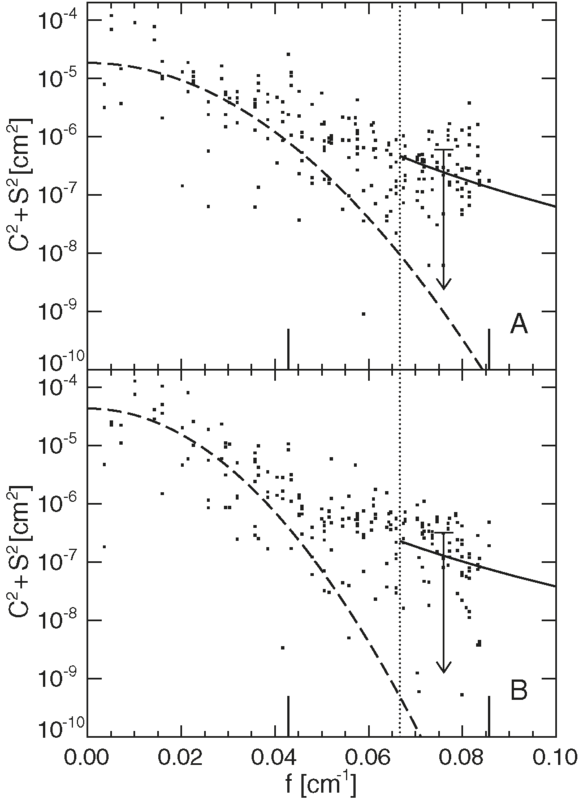 Dashed curves: power spectra of primary mirror distortions from ground-based laboratory measurements of the surface, assuming a Gaussian form for the two-point correlation function, with correlation length 9.3 cm for the A side and 11.3 cm for the B side; normalized to points with f < 0.05 cm-1 (top) and f < 0.04 cm-1 (bottom). A-side augmented beam profiles (green) compared to Moon sidelobe data (red). K1 and Ka1 appear to be dominated by diffuse reflection rather than the extended main beam, and so are excluded from the fit. Conspicuous DA-to-DA differences are seen in the quality of the fit, e.g., W1 and W2 as compared to V1 and V2. Contamination of the fit by diffuse reflected light cannot be ruled out even in DAs other than K1 and Ka1; thus, the Moon data are best considered as upper limits. Vertical line: maximum radius of Moon data included in fit, for DAs Q1–W4. Fractional error in hybrid beam solid angle as a function of hybridization threshold, for the V2 DA. 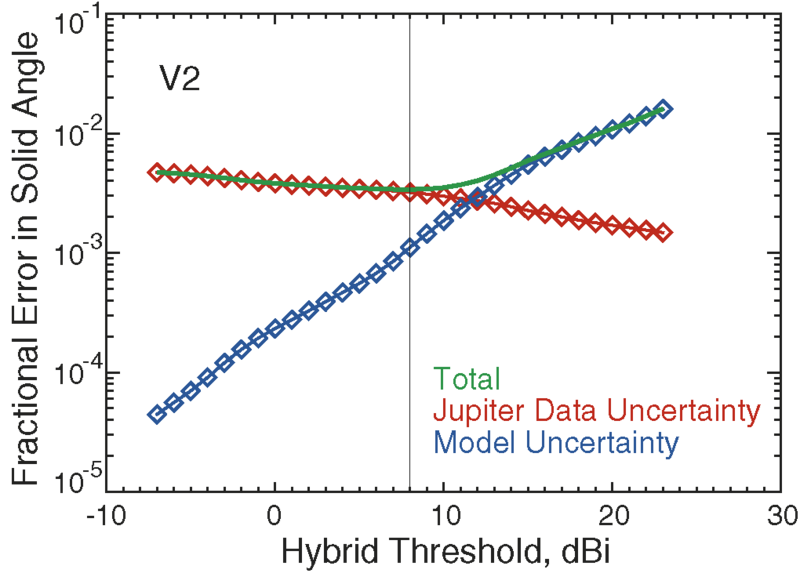 As the hybridization threshold is raised, noisy Jupiter data are excluded, so that the Jupiter data uncertainty (red) falls. 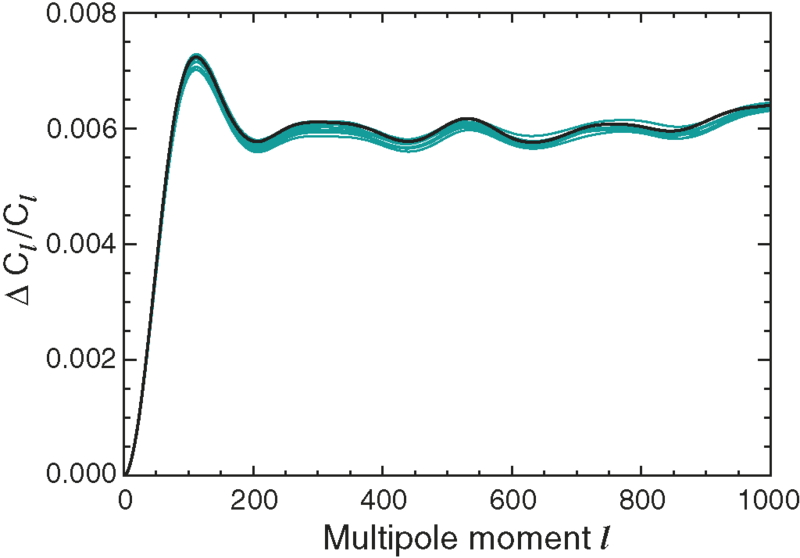 At the same time, the model uncertainty (blue), estimated as a scaling error of 100%, increases because more of the two-dimensional model beam is used. These contrary slopes produce a well-defined minimum in the total error (green). Hybridization threshold values for the five-year analysis are chosen near the location of this minimum, as shown by the vertical line. (Top) Symmetrized radial profiles of hybridized, binned flight beams for the V2 DA. The central, high S/N part of the beam is taken directly from flight data of the planet Jupiter, whereas the part of the beam below a given gain cutoff is taken from beam models. 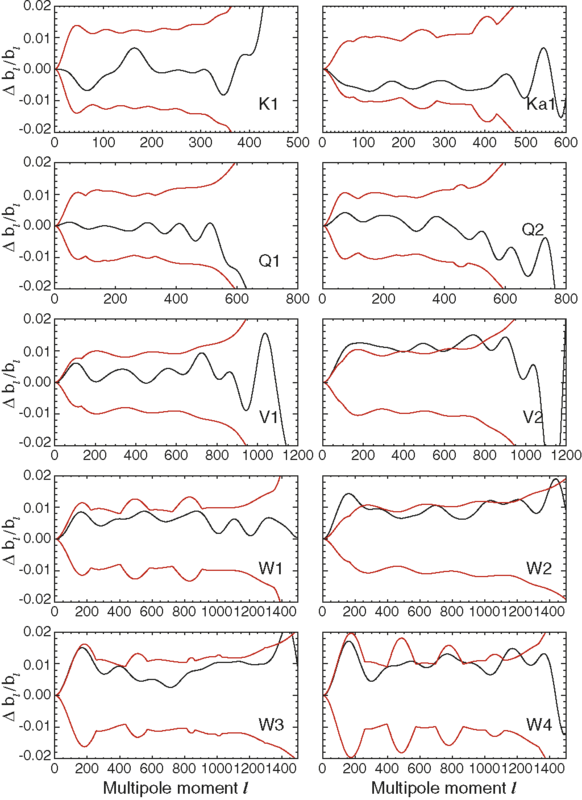 The set of beam models shown comprises several normalizations of the extrapolated primary-mirror distortions; the normalization favored in the analysis is zero, meaning that the extrapolated distortions are omitted. The noise-free lines at radii 3° - 4° are portions of the lower-normalization profiles that include model points only. 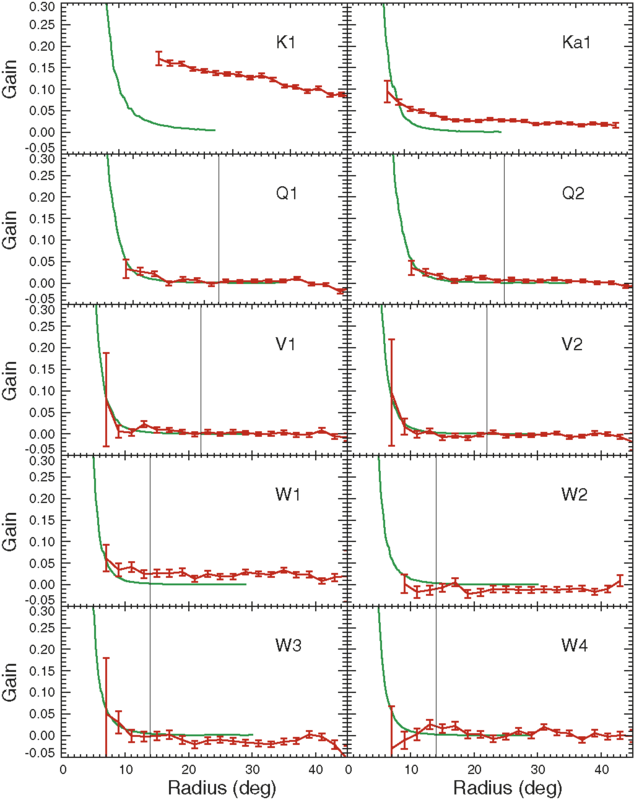 (Middle) Same profiles as in the top panel, after subtraction of the one with normalization 1.0. (Bottom) Beam transfer functions corresponding to the depicted beam profiles, relative to the one with normalization 1.0. Cf. Figure 9, especially the bottom panel. 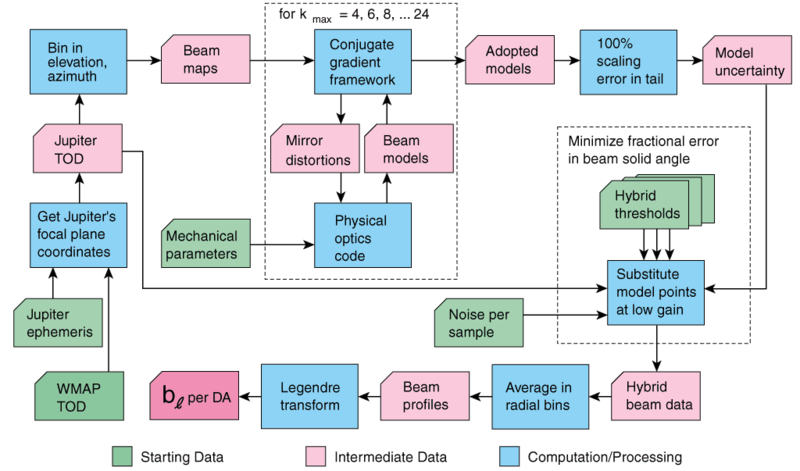 The beam transfer functions at l ≥ 100 are close to what is expected from the noise-free simulations, implying good solid angle recovery. 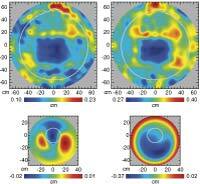 (Top) Radially binned noise-free simulations of hybridized beams for the V2 DA. The central part of the beam is taken from the adopted DADRA model without augmented distortions. The part of the beam below a given gain cutoff is taken from augmented beam models with various normalizations of the extrapolated primary-mirror distortions. The analysis of hybrid beams including real Jupiter data favors the zero normalization, meaning that the extrapolated distortions are omitted. (Middle) Same profiles as in the top panel, after subtraction of the one with normalization 1.0. (Bottom) Beam transfer functions corresponding to the depicted beam profiles, relative to the one with normalization 1.0. Fits using flight hybrid beams should approximate the curves shown here. 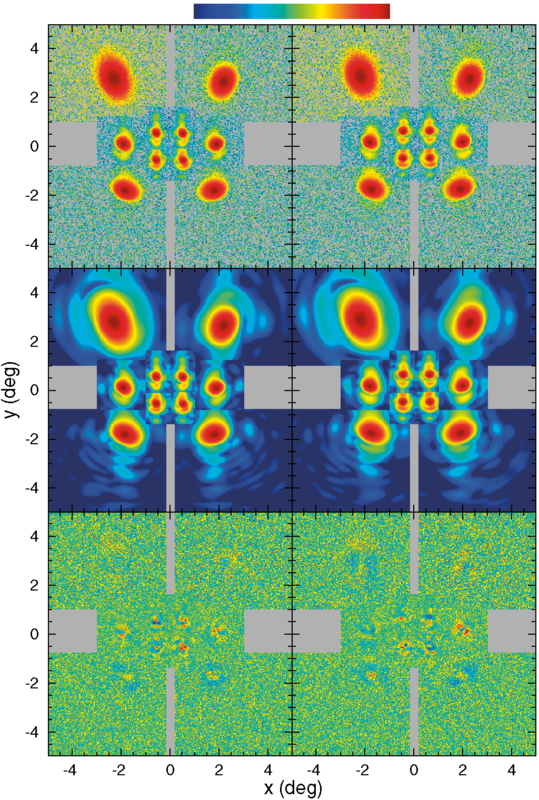 Consistency of CMB power spectra across frequency bands, for window functions derived from various normalizations of the extrapolated primary mirror distortions. Complete omission of such extrapolated distortions from the main beam model is justified by this criterion. The CMB spectra and unresolved point-source coefficients (Aps) in this plot are from a preliminary stage of analysis and are not the final five-year WMAP results. (a)-(e): Mean of year-to-year cross spectra in each DA, relative to the final combined power spectrum from the three-year analysis. The applied wl are derived from hybridized beams in which the tail is from a beam model with extrapolated primary mirror distortions; hybridization thresholds in each DA optimize solid angle error for the nominal amplitude of these added distortions (Figure 5). Spectrum is binned in l with a bin size of Δl = 35. The panels differ in the scaling of the extrapolated distortion amplitude on the mirror: (a), 2; (b), 1; (c), 0.5; (d), 0.1; (e) no extrapolated distortions. (f) Scatter among the DAs in each l bin for the five normalizations of the extrapolated mirror distortions. Omitting the extrapolated distortions (Norm 0, black) minimizes the scatter in the CMB power spectrum over most of this l range, which includes the first peak near l ~ 200. 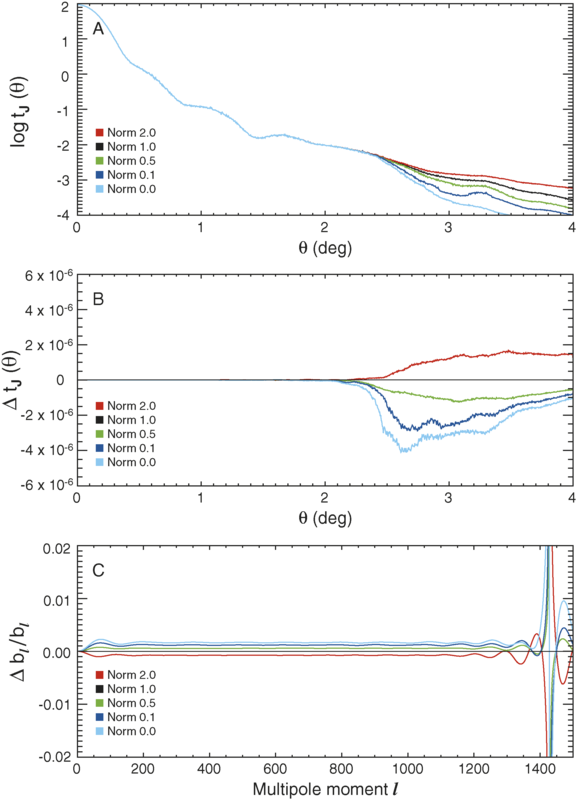 Relative error in beam transfer functions (Δbl/bl) for the five-year beams (black) vs. the three-year errors (red) (Jarosik et al. 2007). The five-year uncertainties are typically a factor of ~ 2 better than three-year uncertainties. Relative error component that is due to estimated beam errors in the final WMAP TT power spectrum, which is combined from V and W band data. Cyan: eight independent instances of the square root of the diagonal of the covariance matrix for the coadded VW Cl; each instance is based on 5000 Monte Carlo realizations of V and W beam errors. Black: the instance that has been chosen for the Cl error bar, because it is approximately the upper envelope. Consistency within ~ 1σ of five-year beam transfer functions with three-year beam transfer functions. Black: difference of three-year minus five-year bl, relative to the five-year bl; the low-l rise or fall for several DAs reflects solid angle changes detailed in Figure 14. Red: three-year 1σ errors. For this plot, the beam profiles used to compute bl are extended by including the profile of the inner portion of each sidelobe response pattern, and the resulting composite profiles are integrated out to the five-year transition radii. This removes the effect of the larger five-year transition radius. Much of the solid angle change between the three-year and five-year beams arises inside the three-year main-beam boundaries. 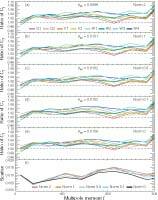 In this figure, the beam profiles are extended to a radius of 10° using the three-year or five-year sidelobe response pattern, respectively, and the beams are normalized to give the same b200 for both three years and five years. Solid angle changes by |ΔΩB|/ΩB < 0.5% for the K1, Ka1, Q1, Q2, and V1 DAs, and by 0.8% ≤ ΔΩB/ΩB ≤ 1.5% for the V2 and W1–W4 DAs. Left : Five-year symmetrized hybrid beam profiles (red) and three-year Hermite-fitted beam profiles (black) for selected DAs. The five-year profiles include Jupiter data and so are noisy, whereas the three-year profiles are the functional fit only. Dashed line: three-year transition radius (Table 3). Dotted line: radius where five-year hybrid beams consist of 50% data and 50% model. Right : Change in beam solid angle from the three- to the five-year analysis, as a function of radius, in annuli of 1°, expressed as a percentage of the five-year ΩB. Dashed lines: Transition radii for three years and five years, respectively. Dotted lines: 50% data radius of hybrids, as in left column. Comparison of WMAP observations (Table 7) to the Mars brightness model of Wright (1976, 2007), evaluated at a wavelength of 3.2 mm (W band). 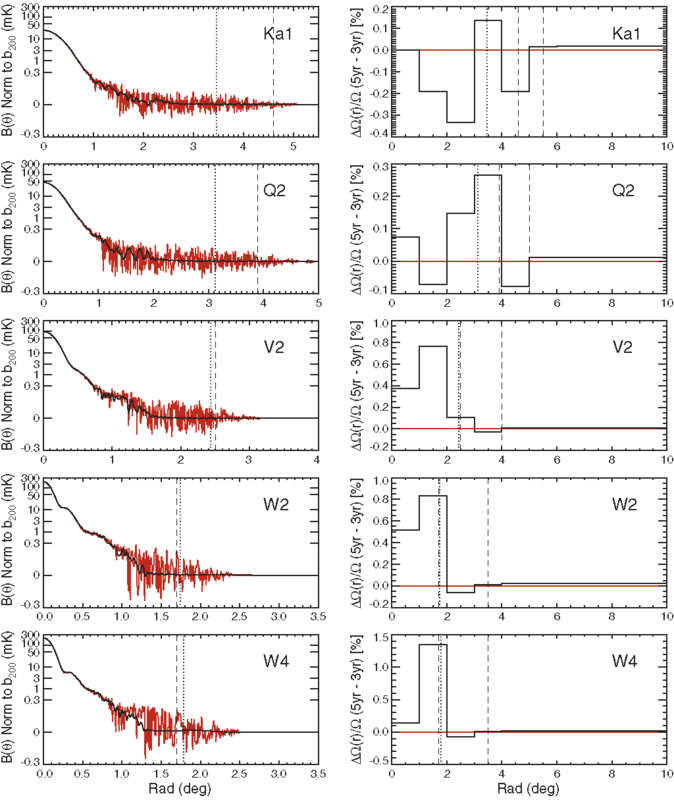 Mean WMAP meaurements are shown for each observing season (diamonds), with error bars indicating the scatter among WMAP DAs W1–W4. Model values (red) are rescaled by 0.9 to bring them into overall agreement with the measurements; thick portions of the line indicate observing seasons. 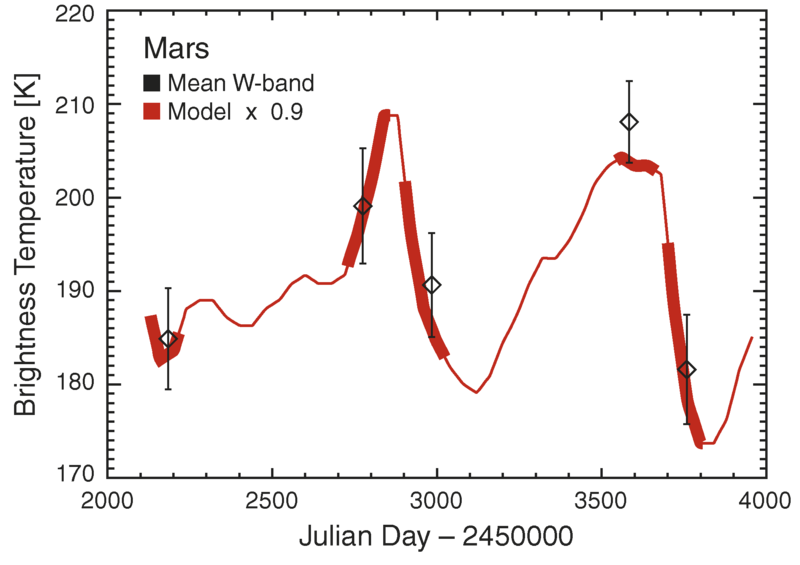 WMAP data are referenced to a fiducial distance of 1.5 AU and a solid angle of ΩrefMars = 7.156×10-10 sr (Hildebrand et al. 1985). 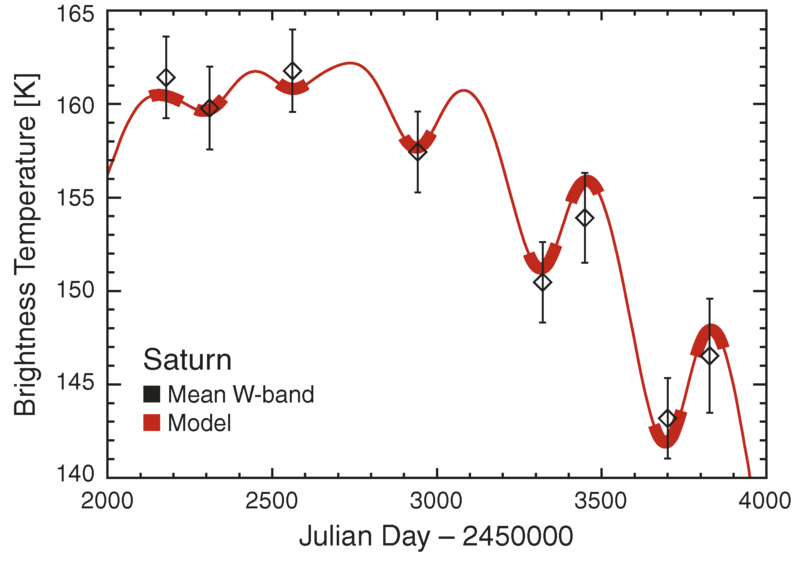 Season-by-season WMAP radiometry of Saturn in the W band (Table 7). 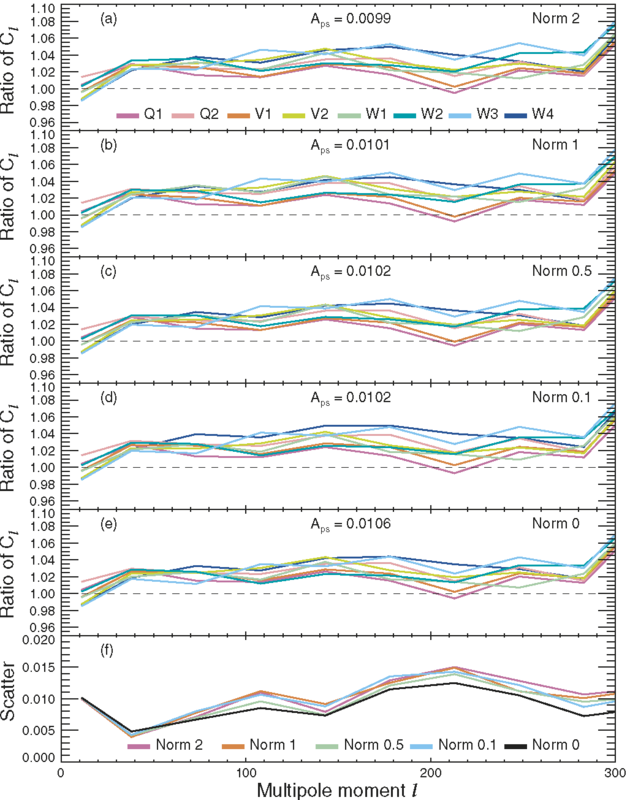 Diamonds: Mean WMAP measurements for each of eight observing seasons, with error bars indicating the scatter among WMAP DAs W1–W4. WMAP data are referenced to a fiducial distance of 9.5 AU, corresponding to a Saturn solid angle of Ωref Sat = 5.101 × 10-9 sr (Hildebrand et al. 1985). Red line: simple fitting model of the form TSat = T0 + α sin i, where i is the inclination of the ring plane from our line of sight. Thick portions of the line indicate observing seasons. Fitted parameters are α = -132 ± 16 and T0 = 102 ± 7.